With all the recent catastrophic hurricanes, earthquakes and wildfires impacting the US, let’s talk about the next Great UW ShakeOut. Our biggest natural hazard threat here in the Pacific Northwest is an earthquake. While Washington does not experience earthquakes as frequently as, say, California, when we are hit with the next 7, 8, or 9 magnitude earthquake, the results will be devastating. One of the main reasons for this is when people aren’t accustomed to experiencing earthquakes on a regular basis, they are less likely to become prepared for one! Well, lucky for you the 2018 Great UW ShakeOut is just a few days away! The Great ShakeOut is a national program that encourages and supports organizations and individuals alike to practice what every person should do when an earthquake hits: DROP, COVER, and HOLD ON. Of course, there is nothing we can do to stop an earthquake, and so the very first (and most important) thing to consider during one is life safety. Studies have shown that people injured during an earthquake are either hit by objects inside of a building not bolted down or held in place one way or another, or as a result of trying to run and/or evacuate a building. It is for this reason that the standard response to the ground shaking is to DROP, COVER, and HOLD ON! 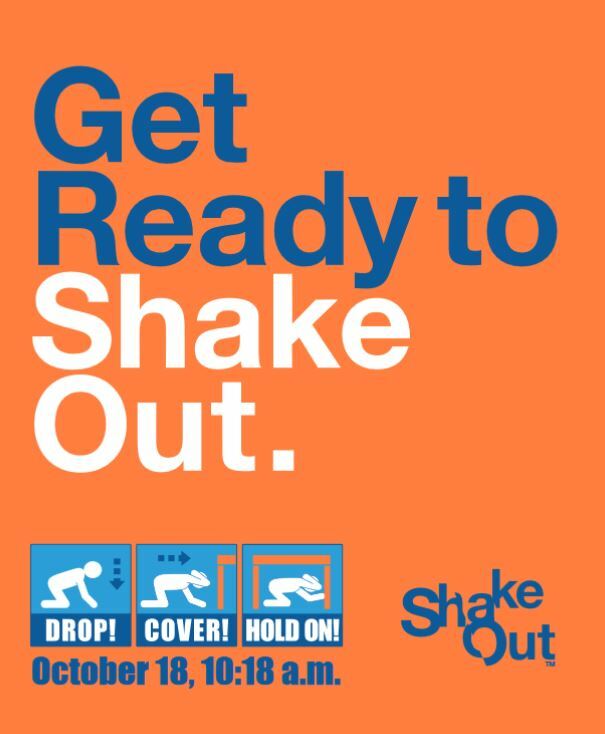 The Great UW ShakeOut is an opportunity for everyone to practice this action and develop a little bit of muscle memory for the real event. For the first time in UW Seattle history, all 3 main campuses will be testing our UW Alert notification system around the same time as part of the Great ShakeOut – this year being 10:18 am on Thursday, October 18th. There are many ways to participate in the drill beyond getting the notification, or even practicing DROP, COVER, and HOLD ON. For example, your team could talk about emergency planning, take inventory of emergency supplies, practice evacuation procedures, and so on. Yes! We have created a flyer for you to print and post in your area, department, or building. Download it here. And then keep an eye out for a few more preparedness tips and specific resources that UW Emergency Management has to offer you and your team. Click HERE for more detailed information on how you, your family, your UW peers and others can prepare NOW for the “Big One!